« Could car insurance quotes really fall? 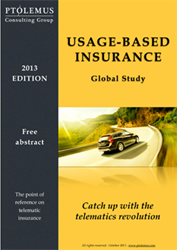 Since the release of the first edition in June 2012, the market share of Usage-Based Insurance (UBI) policies has doubled. PTOLEMUS evaluates that 5 million vehicles are today covered by Pay-As-You-drive (PAYD) or Pay-How-You-Drive (PHYD) policies. This is only 0.6% of the global motor insurance market, yet represents 3.5 billion in premiums. The UBI Global Study brings unparalleled analysis of the drivers behind the sectors rapid growth and of the challenges ahead, together with a complete set of best practices to successfully launch new UBI services. An analysis of the insurance sector worldwide and the impact of UBI with a never-before-seen synthetic analysis of the US filing process. The free abstract can be downloaded from http://www.ptolemus.com/ubi. The most successful UBI models answering the perennial question: “why give a discount to the most lucrative policyholders? This study comes at a critical time for the UBI market and is invaluable to insurers and service providers, as the motor insurance market faces structural losses due to heavy price competition and rising claim costs. Telematics-based insurance offerings have the potential to bring the insurers new competitive advantages, notably better risk pricing and lower claims costs. The abstract entitled UBI Market Fundamentals provides a snapshot of the UBI industry today and an understanding of the key questions facing the insurers. Download the Free Abstract today here and receive instant notification as soon as the full study is published. PTOLEMUS Consulting Group is the first strategy consulting firm entirely focused on telematics and location-based services and. Run by Partners in Brussels, London, Paris, Milan, Hamburg and Boston, PTOLEMUS assists leading insurers, car makers and service providers in defining and executing their telematics strategy. For press relation and more information about the study, please contact Thomas Hallauer on thomas(at)ptolemus(dot)com.